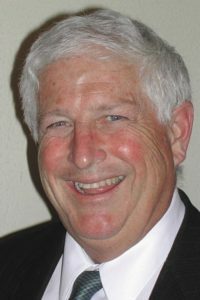 Editor’s note: A column by Republican Mike Brown will run in CalCoastNews every other Thursday, rotating with a column by Democrat Stew Jenkins. Recoiling from the defeat of Hillary Clinton, the more astute and serious Democratic Party analysts have concluded that their party’s policies had failed its historic blue-collar labor base. That base finally revolted after decades of irrelevant Democratic promises and policies, aided and abetted by Republican compromise. Those heretofore loyal Democratic voters gave Trump victories in Michigan, Ohio, Pennsylvania, West Virginia, Iowa, Indiana, and Wisconsin – victories (some very narrow and some very large) that ran counter to the reigning political calculus – the so called blue wall. But the Republicans shouldn’t gloat. Trump, the party crasher, won because he gave voice to the “deplorables” and coalesced the long simmering grievances of conservatives, the sinking disaffected middle class of both parties, and as it turned out, real workers. Those are the wrench-turning, machine operating, truck driving folks who sweat on the job and who actually harvest raw materials, grow food, build things, make stuff, and deliver it. Erroneously, this constituency was taken for granted and assumed to be safely in the Democratic fold. As NPR’s Domenic Montanardo pointed out, the GOP, with standard-bearer Trump, made huge gains in voters lacking college degrees in the industrial north. Like federal national security agencies in recent years, both the ever dithering checked pants Ivy League Republicans and the ever smugly social justice preaching Democratic Ivy League intelligentsia have experienced an intelligence failure. This is somewhat surprising, especially for the Democrats. Out in America away from Malibu, Manhattan, Marin, Miami Beach, and Metro DC, the people have been crying for relief for decades, but instead, and notwithstanding which party was in charge, many of their communities have been in a death spiral since the early 70’s. Since the 30’s, the Democrats have proclaimed themselves as the party of the working man and woman and in recent decades as the arbiters of social equality, environmental salvation, and political correctness. As it turns out, none of their massively accumulative and oppressively expensive initiatives, along with the accompanying $20 trillion in Federal national debt, have actually saved Hartford, Allentown, Akron, Detroit, Flint, Dayton, or hundreds more. We watched them like clouds as they have floated by. JFK’s “New Frontier,” Lyndon Johnson’s “Great Society,” Jimmie Carter’s “A Leader for Change,” Bill Clinton’s “We Need a Change” and Barrack Obama’s “Hope and Change” never actually stopped the decline of hundreds of cities in New England, the middle Atlantic region, upper Midwest, or even some in California such as Oakland, San Bernardino, Stockton, and Richmond. In fact, and in California, their water and environmental policies have turned the San Joaquin Valley into an economic disaster zone and social tragedy. As predicted, plastic bag bans, carbon taxes, Obama Care, piling on public pension debt, and diverting water for extinct fish haven’t exactly helped expand our roads, fix our decaying public buildings, generate jobs that can support a household, or reduce California’s massive welfare role. We’re the ones that need it worst. And let’s rebuild America first. Who’s blessed an’ who has been cursed? But let’s rebuild America first. Who’s on the Hill and who’s watchin’ the valley? An’ who’s in charge of it all? And dadgum the rest of it all. They had better, because if they fail, and given the current set of promises, the backlash will thrust the enviro-socialist – collectivist elite into unassailable power. If that happens, not only will America not be great again, but it won’t even be America. Mike Brown is the government affairs director of the Coalition of Labor Agriculture and Business (COLAB) of San Luis Obispo County. He had a 42 year career as a city manager and county executive officer in four states including California. He can be reached at mike@colabslo.org. 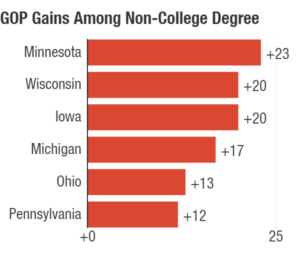 One has to wonder why the non-college voters continue to gravitate towards a party that, time after time, does them the most harm. Refusing to raise minimum wages, eliminating Planned parenthood, busting unions, creating a prison system with a population percentage that is one of the highest in the world…it seems like some sort of Stockholm Syndrome. Asterisks prayers is about all we have to keep us going anymore. We have to give Trump a chance and see what happens because as the professional politicians haven’t shown me they have a clue on how to run the country anyway.As for the lies you say he is doing we have to wait and see and if it’s true why would you be surprised as every politicians lies. On SS the politicians robbed it for years, we pass laws and make our companies spend money to clean up the air and across the border in Mexico they pollute it faster than we can pass new laws, You ever look at what you get with Obama care. The plans people can afford basically offer no coverage as the dedutables are so high before you get anything and they can’t afford to pay the deductables anyway. You gave people medical coverage on paper but it’s basically useless to them.When you turn 65 you have to sign up for medicare and even though you have other insurance medicare is used first and it pays almost nothing on the bills so a lot of doctors won’t take it now. The government wastes so much money that if they controlled that then they wouldn’t be cutting all the other things but they will never do that. Russia didn’t change the outcome of the election the people did by not voting for the usual bull thats put out. They say Clinton was the chose of the people as she won the popular vote. She was the choice of Calif. and New York because without their votes she wouldn’t have the popular votes. Both these staes have been run by Democrats forever and look at how much they are in debt and how bad off they are. Will Trump change things for the better? We hope so but have to wait and see. People of my generation are going to have to start living minimally. There will be limited, if no, social security when I’m old and tired. Our manufacturing jobs are overseas, producing cheaply made crap we don’t really NEED. I am seeing jobs that pay less, do not offer the pensions and benefits my parents and grandparents once enjoyed. I have zero faith in our political leaders. I believe the People need to plan for this new America, an America with no loyalty to workers, no loyalty to customers, no loyalty to constituents, and plan accordingly. It is really just pragmatic at this point. And we’ve only just begun to feel the effects of technological displacement. Mark Carney —the Governor of the Bank of England (a job similar in scope to our Fed Reserve Chairman) just said he fully expects ½ of all uk jobs to be replaced by ai over the next 10 to 15 years. We better start coming up with some solutions fast because the whole system will unravel if unemployment gets anywhere close to that number. This is going to be a problem. Although one of the causes is the lack of work ethics. Over the years, long ago, I have hired many people. In my day people showed up to give you a days work. Gradually over the years many “workers” didn’t really wanted to work, wanted more money and benefits, would figure out ways to get out of work, fake injuries for state comp and so on. Unfortunately the way to get around this for many is to have a machine that will work, be productive and cause no problems. Sad. You DO realize that The Hag’s song was a direct response to the Bush Doctrine, right??? Written in 2005? Right after the Afghanistan and Iraq wars…BEFORE Obama was even a twinkle in the electorate’s eye! It’s amazing to me that the Trump Chest Beaters want to wipe away their votes in 2000 and 2004, forget the deregulation that was a major cause (not the only cause, but a major cause) of the financial crisis we have only now climbed out of, forget the TWO wars and trillions of dollars given away to other countries while our infrastructure crumbled, etc. No, it’s back to saber rattling (although this time via 70 characters or less…SAD), unchecked speculation/regulation, reduced taxes accompanied by a TRILLION dollars in spending on infrastructure alone! We know how this one ends already, and the answer is not “smashingly well” unless you’re feeding at the high end of trickle-down trough. If the feed line gets cut off, I’m sure we’ll ALL be back to bailing all of the fattest hogs again. It’s like a train wreck in slow motion…on a train that ran into the same wall just 10 years ago. I firmly believe that our infrastructure is in need of repair…in fact, I believe the stimulus was not ENOUGH money the first time. I hear all the angry cries against “tax and spend” and “out of control deficits” and I am in awe…This “new” approach proposed by Trump is exactly the same as George W. Bush’s. It’s definitely not “tax and spend”…now it’s going to be back to tax LESS, but spend MORE? And this will fix the deficit HOW? So much of our country requires attention, from trade to defense to education to immigration to health care (not just insurance), the list goes on and on…it all needs attention, but all we get is lip service and gridlock. I understand that we cannot isolate ourselves from the world, and we cannot turn a blind eye to other countries in need, but like Hag said, we need to look towards home first. Walling ourselves off, spending at will while collecting at a minimum, and ignoring many problems that don’t fit our chosen narrative are not solutions. Appointing a Secretary of Energy like Rick Perry (who wanted eliminate the department he will be “running”), a Secretary of Education who has never taught at, attended or sent a child to a public school, a Secretary of State who runs the world’s largest corporation and is close with one of our greatest enemies, Secretaries of Commerce and the Treasury that are from the very same big banks and corporations that he bashed Hillary for being in bed with…These are not ways to improve our current situation. This is not draining the swamp, it’s raising the levees that are holding it in, while chumming the waters to bring out all the predators! Where is this “compromise” of which you speak??? If you mean we, as a country, have decided to compromise the very values that make us the greatest nation ever conceived, then I agree! Wholeheartedly! Believe me, I am no Hillary Clinton supporter…and I don’t have an answer to the question of “If not Trump or Hillary, then who?” All I know is we should treat our own people better…we should be kinder to each other in our individual dealings, we should care more about more. We need answers…not slogans, not sarcastic quips from on high, not fingers of blame pointed all directions outward. I am not saying I have the answers, but I am also saying the incoming administration, in its first few weeks of transition, appears to have all the answers, just most of them are 100% wrong. I think that there are “right” answers on both sides of the aisle, but the money that is pulling the strings prefers the status quo, so those answers are never asked for, much less given. Here’s one such answer: You want to “fix” illegal immigration? Institute a requirement for all company’s hiring to utilize the eVerify system…You know who’s against that? The Chamber of Commerce and most of the corporations who benefit from illegal immigration! I honestly hope that our country fares well in the next four years, but not in some sort of Ponzi scheme that is built to fail. And definitely not at the cost of the civil rights of our own people. What Trump’s rhetoric did (besides get him elected) was to make it OK to be tribal, sectarian, jingoistic and, I’ll say it…racist and homophobic. Not saying Trump himself is (I don’t know) nor am I saying that many of the people who supported him are, but it has provided an atmosphere where this type of behavior is tacitly accepted. For example, Alec Baldwin and SNL lambast Trump and he reacts (via Twitter), the audience and cast of Hamilton do not accept Mike Pence and Trump reacts (via Twitter), but a woman berates other women for not being “from here” and not “speaking English” and “being on welfare”, etc., etc. and the twitter crickets from Trump’s account are deafening. “Lock Her Up”, “Drain the Swamp”, ban/inter the Muslims…the list of divisive rhetoric goes on and on. But now we’re hearing that he was just saying things to get elected…Not the first nor the last politician to do so, I’ll admit. However, he has awakened a hateful, scared, dangerous sleeping portion of our electorate that now feels they have been heard and are given license to hate outwardly and to act on that hate. It’s scary…I truly hope that he can put that genie back in the bottle, but as of yet, he’s made little to no effort to do so. He’s been busy watching SNL instead, apparently. Good luck to us all, and let’s all try to do the best we can to be the best we can…for each other, to each other, and with each other. The last 40 years has largely been a slow-moving corporate coup where elitist interests buy their way into government and then proceed to break it. Once they’re done they use half-truths and rhetoric to obfuscate truth and to dupe people via corporate media into wanting to get rid of those government functions altogether. This is a robbery, and general incompetence is just a smokescreen. Prayers are not all we need. The people happy about Trump’s election? Those are the people who don’t realize that they’ve given away social security, clean air, health insurance and still have a smile on their faces. The people benefiting from Trump’s electoral college win? Those are the people who stand to profit from taking away* Social Security (by “Privatization”), taking away* medicare (also to “Privatization”) among other things, gutting the environmental regulations and health insurance. *or greatly impacting those who need it most by reducing payments or efficacy. The people that benefit are those who run the huuuge corporations like Walmart, where raising the minimum wage would affect their bottom line. I’m about to retire. I’ve paid into SS all my life. SS funds are from FICA, which the employee pays. So how do Americans benefit from this? I may have to rely on Medicare, especially if the Affordable Healthcare “obamacare” is repealed or replaced. Oh, but Medicare is also being co-opted by special interests that benefit by selling off parts of it or reducing coverage to benefit the private insurance providers. Great. 7 MILLION in Additional tax cuts, is still moving more than half of the jobs to Mexico. So far, Trump has lied about jailing Hillary Clinton and admitted as much to his self-congratulatory tour. He has lied about divestiture of his businesses as required by law. He has lied about the “build the wall” campaign and admitted as much. And he is stacking the decks against the few remaining environmental regulations by putting Oil execs in charge. Russia co-opted the free American election. RUSSIA. This is one of the last things that other countries looked up to us for; honesty and transparency in the democratic process of nominating our President. I’m neither Democrat nor Republican, but frankly, this is a sh*t storm and we’re witness to the whole kaboodle. 1. Privatization of SS was offered as an option, not a mandate. 3. Whether it was Russia or some dude living in his folks basement, the fact is if there was nothing to hide, there wouldn’t be a problem. For “not a Democrat” you certainly have all their tired, old (like their last candidate) worn out ‘talking points’ (lies actually, like the bad GOP will take away your SS) down pat. Remember Trump was almost as hated by the establishment GOP as by the Loony Leftists. Fisrt the Russians? Really? So cuddling up to a brutal Communist dictatorship in Cuba is just fine but the pesky Russians must have had troops on the WI MI border to keep ‘ol Hillary from campaigning in WI. Maybe they slipped the idea of calling 30 Million Americans ‘irredeemable deplorable’ in one of her e-mails from Podesta. I can’t help to be laughing so hard I can barely type… ” honesty and transparency in the democratic process of nominating our President.” tell that line to Bernie Sanders. You Progressives can’t even cheat with any competency, let alone try to run the Big Government monstrosity you created. So you want Hillary locked up for her crimes or are you just blowing more smoke? You need to catch up on some basic economics to call a $7 million of tax breaks to save jobs that actually generate a tax base which will be larger than $7 million vs. your Democrat math of 0 jobs=0 taxes equals 1% GDP like under Obama. The electoral college is why we a stable Republic vs. Democratic run democracy (again your version of a happy place) were the mob can vote themselves more free stuff…How’s that working out in the People’s Republic of CA? Great article although I hope tha these ideas are also applied to our local governments who have been just as guilty while ripping the taxpayers off. This is an opportunity for the people to stand up and challenge the misuse of government funds for their self entitlements. Mike, I saw this in two visits to the Midwest this year. Trump signs were everywhere between Grand Rapids and Kalamazoo, Michigan. Only saw two Hillary yard signs in two weeks in September. After the election in November there were none, but half of the Trump signs were still up on December 1st. Somehow, the major networks headquartered in NYC missed this. Don’t be surprised to see major changes in the direction this country has been heading. Prayers for what’s ahead. I’m excited but a little guarded because we will have consequence (???) to be ready for. Having said that, I like what is happening so far and Trump is not even sworn in yet. Very exciting!